A positive thing I can say about Jailbreakers is that Adrien’s character, “Skinny” (that’s the only name he’s ever given) appears right away. So… it has that going for it. Cast: Shannen Doherty, Antonio Sabato Jr., Adrien Brody, Sean Whalen, Adrienne Barbeau… and what amounts to a cameo from Charles Napier. Rebel Highway was a TV show of sorts that aired on the Showtime network in 1994. According to IMDb, it was “A series of made-for-TV movies inspired by B-movies of the 1950s.” There’s our fair warning: “…inspired by B-movies.” One should not expect Shakespeare, here. Even taking into account this is probably supposed to be bad, as an homage to “B movies,” this is still just awful. This one was directed by William Friedkin, the man who directed The French Connection and The Exorcist. No. Seriously. You’d think that would give you a little bit of quality, here. But, you’d be wrong. 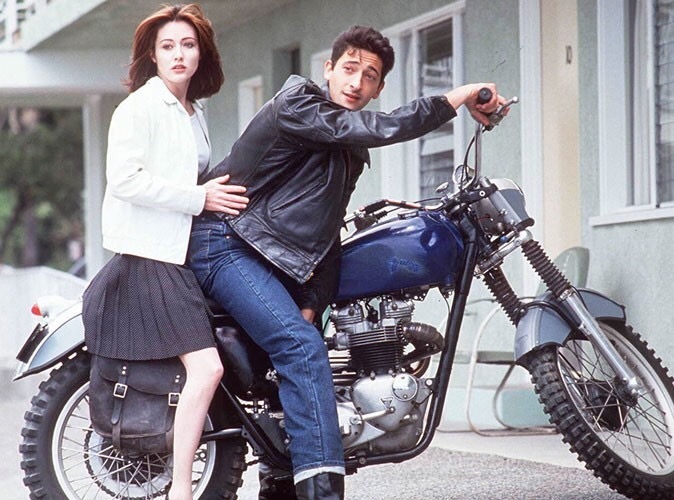 The biggest issue is the casting of Shannen Doherty as Angel (the co-lead). She is far too modern in her look and way of speaking to fit in with the period the others are inhabiting. She almost seems like a time traveler from the 1990s who decided it would be fun to be in high school in the 1950s. She’s also not believable as a “good girl” for a second. Granted, Angel proves to not be as pure as the driven snow, but we are supposed to think so at the start. Nope. You never think that. She has an “I’m a trouble maker” vibe about her from the second she appears. Also, her line delivery is wooden. Her co-lead, Antonio Sabato Jr. plays Tony Falcon (yes, that’s his name), the local “bad boy”/hoodlum who comes into Angel’s life and “corrupts” her. His acting is only about 2% better than hers. If that. Actually, now that I think about it… he’s worse most of the time. I actually feel badly for Brody, Adrienne Barbeau and Sean Whalen. They all give performances that are much better than the material deserves. To their collective credit, none of them had an “I’m too good for this” air about them. That must’ve been harder to pull off than the roles themselves. Rather than hash out any more details, we’ll move on to Adrien’s performance as Skinny, a member of Tony’s… gang, I’d guess you’d say. We get a sense that Skinny actually has a good head on his shoulders, but wants so badly to fit in that he’s playing tough. Adrien nearly always brings nuance like this to his characters. There is something likable, redeemable and relatable about virtually every man he portrays (there are rare exceptions). Adrien does the best he can with what he’s given here. He is especially charming doing a Marlon Brando impression in a diner scene, and interacting with a horse he and Tony are selling. Skinny ends up being used and betrayed by Tony, and Adrien portrays those feelings very well. Skinny actually winds up being a heroic figure in the end, which was surprising and nice to see. Speaking of Skinny’s heroic actions. One of the most laughable moments comes when Skinny swoops in on his motorcycle to rescue Angel. Below, you will see the obvious stunt double who was not only seen, but who basically gets a nice closeup. Who missed that one in editing? Was it left in purposely, to fit in with the B-movie homage theme of the series? One cannot be too sure. As it stands, though, it is hilarious. You know, if Adrien Brody wasn’t in this, it would not have gotten a second watching out of me, much less a DVD purchase. And that’s really all I can say.